I started this little yarn a couple of years back. The Ghazen are delightful little creatures and I had great fun with them for a while. And then suddenly, without warning, they abandoned me. Now, I’m trying to lure them back to play with me after I’ve finished this little murder I’ve got cooking. What do you think of these wee crachurs? What do you reckon; should I try to bring them back? Deep in the forest stand ancient trees as big around as a house and so tall the tops can’t be seen. Many of these trees are hollow near the ground. If you get down close to the openings and be so very quiet you can hear something. What could it be? 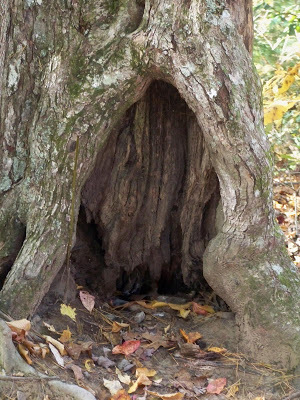 A tiny race of people who call themselves Ghazen have built their homes inside these trees. They are carved from the wood and rise many stories like the old townhouses in the “big world”. The Ghazen spend all their lives living inside the trees and rarely going out into the forest for fear of being captured by the “Big’uns”. The Ghazen seem to have been born of the trees themselves. Their skin is rough and greyish brown and occasional flecks of white here and there. Their bodies are narrow at the hips and widen just a bit up toward the head which is topped with twig-like hair. Twigs also form the brows over their enormous eyes that look just like a human’s eyes except when they blink. The eyelids seem to slide down from some invisible place over the eyes and you can hear a delicate “snick” sound like two tiny bits of wood colliding. The same sound can be heard from their rough lips when they speak. Their language seems to be composed of snicks and clicks and, when they are angry a kind of grating sound comes from their throats. Sticking out over their lips are huge woody noses that look as if a branch was cut away long ago and the bark overgrew the wound to form a nose. Their thin, reedy arms and legs end in fingers and toes with long sharp claws to aid them in climbing about in the trees. They look a bit scary, a bit funny and completely strange to our eyes because we would never, ever expect to see such a creature. In reality, the Ghazen are a happy, simple people not much given to fighting and arguing. They generally obey the rules and enjoy raising their families. They are at their best when they have village gatherings. Everyone from the tree village comes and brings food and drink. There is music and dancing and games and they all have great fun! This entry was posted in Ghazen and tagged Fiction, random thoughts, rubbish, writing. Bookmark the permalink. Oh, I like the Ghazen already, Jim. They sound like a fascinating people. May they capture your mind and imagination until you have to write more about them. Fascinating, fascinating, fascinating! Thank you, George! You’ll love ’em even more when you finally see their picture. They’re just delightful! Thank you very much, my friend. So far, they’ve been a really fun group. We will see what their future holds. Thanks, I’m happy you enjoyed it. Keep coming back, you never now what you’ll find here!